Autostrada A1(Highway A1), take exit "Firenze-Scandicci". Follow directions PISA- LIVORNO. After 300yards take exit "Scandicci". From Pisa (SGC Fi-Pi-Li) take exit Scandicci. Central station of Florence (Santa Maria Novella). Owners will be glad to meet you at the station, the airport or at exit Firenze-Signa of Autostrada A1. Take exit Firenze - Signa of Autostrada A1. Turn left on traffic light of SS n.67 Tosco-Romagnola (Via Pisana) always following indications for "Scandicci" (and Firenze). Before underpass of Autostrada A1 turn right following indications "RINALDI". Keep going straight on roundabout and turn right on next intersection (indication: brown sign "VILLA ANTINORI" and others). In Rinaldi leave Villa Antinori to your right and continue straight in the curve to the right of the road. After 50 yards, turn left in VIA DELLE PRATA. Via delle Prata is a country lane with many turns. Follow it to the end (about 1,2 miles). Turn right in VIA DI TRIOZZI. Follow Via di Triozzi for about 300 yards till you find a sharp left turn. To your right you find Viuzzo di Triozzi (dirt road). Follow Viuzzo di Triozzi passing a farm house on your right. In front of you on the hilltop is PODERE VALDIBOTTE. If you do not feel like finding us yourself, please don’t hesitate to call us and let us know your approximate time of arrival. If you do not have a mobile phone, there is a public phone at the ESSO service station immediately on your left after the first roundabout you find leaving the A1 at Firenze-Signa. We shall come and meet you there. 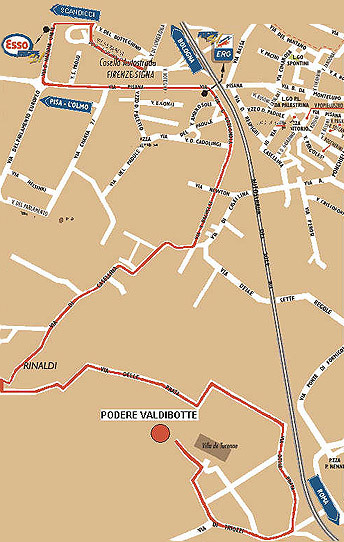 At 1Km from PODERE VALDIBOTTE is the bus stop of bus No.16. It will take you to the historical centre (Santa Maria Novella) in 20-25 minutes. If you want to go to the centre by car (25 minutes) we shall provide you with all the necessary information, when you are here. A taxi to go downtown costs about 18.00 Euro.